On July 2, the 385th launch of a Proton rocket looked completely normal — at least at first. The massive rocket lifted off the pad at Baikonur on a column of flames and soared skyward. But, only seconds into the flight, the Proton wobbled to one side, and then the other, before arching over and heading back to Earth. First, the payload shroud was torn loose, taking three GLONASS navigational satellites with it. 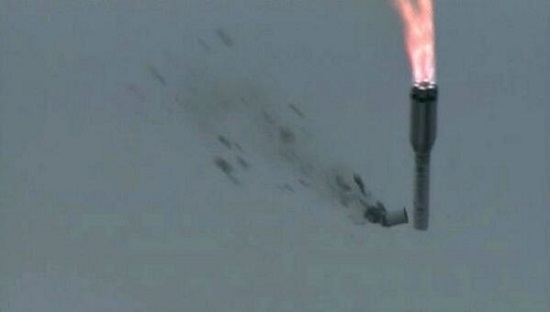 Then the bottom of the rocket caught fire, the flames spreading in seconds to the rest of the booster. The flaming wreck slammed into the ground in a massive explosion that could be seen and felt for kilometers around. As hazmat teams cleaned up the toxic mess on the ground, Russian investigators soon discovered the cause of the accident: a technician at rocket builder Khrunichev had installed three control sensor upside down. As the Proton soared skyward, it couldn’t get its bearings. While space officials took steps to ensure such a mistake wouldn’t be repeated, Russia’s politicians acted quickly to shake up the space industry. Three months after the accident, Popovkin was out of a job. His replacement as head of Roscosmos was Deputy Defense Minister Oleg Ostapenko, who became the space agency’s third leader in only 2.5 years. Officials also named Igor Komarov, the head of Russia’s largest automaker, as Ostapenko’s deputy. Komarov’s job in 2014 is to establish the new Unified Rocket and Space Corporation, a company that will consolidate much of Russia’s sprawling and bloated space industry under its management. Roscosmos will be relegated to contracting, coordination and policy implementation. The consolidation will absorb 33 space organizations, including 16 enterprises. The main focus will be on subcontractors and suppliers. Major companies such as Energia and Khrunichev will not be included under the new umbrella company. The change is likely to eliminate tens of thousands of jobs in the Russian space sector, which employs approximately 250,000 people but operates at only about 40 percent efficiency. By contrast, the U.S. space sector employs about 70,000 and is about 8 more efficient than its Russian counterpart. It’s a bold plan that is either crazy or crazy brilliant. Will the consolidation improve quality control and bring much needed efficiencies to the bloated space sector? Or will it eliminate competition and destroy any chance the Russian space industry has to compete internationally? How much chaos and confusion will be created by such a massive consolidation? And what impacts will it have on quality in the near and long terms? Nobody yet knows. Much will depend upon what steps Komarov takes in the year ahead. The Russian space industry is set for a massive transformation. And it begins in 2014. This was exactly how they handled things 35 years ago. Putin is reinstalling ‘communism’ in Russia. What a wind borne thing to say. Like they were not arguably the most formidable military in the world and at one time, led us by leaps and bounds in space. Keep thinking they are a bunch of incapable bozos at your peril. First off, What Putin is doing is destroying competition. By putting everything under one control, he risks removing fast advances and instead, getting one solution, which may/may not work. It is the same solution that we did for Boeing and L-Mart by moving their launch systems into one company: ULA. How has that worked for American’s Commercial launch systems? Oh yeah, ULA is the WORLD’S MOST EXPENSIVE LAUNCHERS. BTW, I have stuck up for Russia through out here. Show me where I have not. Sadly, bozos like you are just that: bozos. One last thing. USSR did NOT lead us by leaps and bounds. They typically beat us by a couple of months and that was only because we would announce where we were going and then USSR would out spend us on that. And when they had a one solution track, they ended up with the N1 for the moon. How did that go? In fact, they took many more chances and still did not win out at everything. And to argue about a mighty military from the 70’s? Please. Give me a break. If you do not know that USSR led us in space and by more than a “couple of months” then I have no business talking to you. Not withstanding Sputnik and MIR, if you had taken the time to read the article, you would have learned that Energia and Krunichev will not be under the umbrella, You would rather call people names. I am done with you. good, then you will not insult me again or fly with the ad hominums while screaming about it against you. What i like about sovie^H^H^H^H Russian space industry or any other industry is that you can keep recycling any old jokes from 10 or 30 years ago. Interesting fact. One of the key designers of Lunokhod came over to US to advise on the design of the very first Mars Pathfinder rover. Not that he had much impact but ..
Soviets did telerobotics decades ahead of US. The consolidation has zero to do with a return to communism, and that isn’t how industry operated under the command economy of five year plans. It’s following the global trend for increasing consolidation of aerospace companies, closely linked to state assistance and defence requirements. The biggest influence here is EADS. It’s a little ironic that you lament Putin’s removal of competition from the Russian space sector when the greatest achievement of the US space program (Apollo) was done without competition. The Soviet moon program failed by having too many organisations wasting efforts by competing with each other. I do not think that it is ironic since Apollo was very much a competitive program. All of the sub-systems were VERY competitive. Even the design of the saturn V was moved all over the place. N1 failed badly because of poor QA in their system combined with USSR politics, and USSR wanting desperately to beat the Americans. Reorganization is a crass government admission that the people who are making decisions in the Russia space program are every bit as incompetent as our space program managers. We await Russia’s crowning space achievement: the day that Russia launches a $600 toilet seat. Then and only then will we know that the most brilliant rocket engineers in the world have been totally nullified by NASA-styled management hats.